Most of the crew were settling down to watch the game when, at 8pm this evening a pager alert came in. The volunteer crew dropped what they were doing and made straight for the lifeboat station. 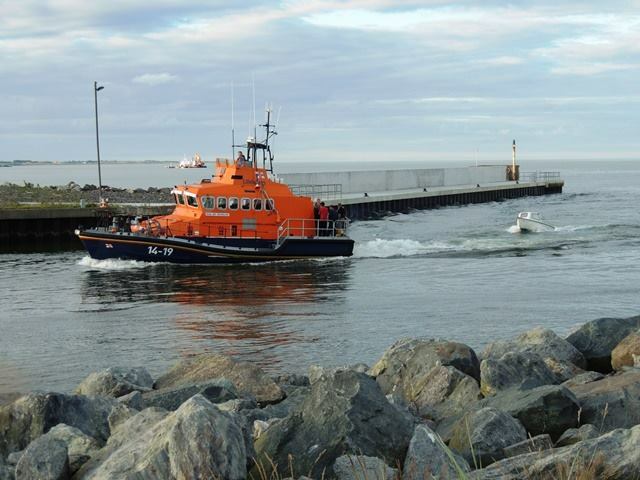 Within minutes of the alert, Ger T was en-route to the distressed vessel and crew, which was a short distance from the Roadstone Jetty, South of Arklow Harbour. Once on scene it was established that the pleasure craft was taking on water and the 3 crewmembers were evacuated to the lifeboat. A tow line was set up and the small pleasure craft was towed back to Arklow Lifeboat Station where our volunteers brought the vessel safely up on to the inner slipway. The 3 crew of the stricken pleasure craft were brought ashore safely at the lifeboat station.